Mango Berry Rosé Sangria - Sparkling rosé, brandy & tropical fruits! To say I have a thing for Spanish food and wine would be a serious understatement. In a past life I spent the better part of a year working at a Spanish tapas restaurant, serving albondigas, patatas bravas and pitcher after pitcher of sangria. I spent many an afternoon in a basement underneath the bar learning the fine art of mixing wine with brandy. It’s a testament to my love of sangria that I can still stomach the drink after the amount of time I spent hovering over large barrels, mixing bottle after bottle. A good sangria has three things: a good wine base, a nice brandy, fresh juice and a large heaping of wine-soaked fruit. 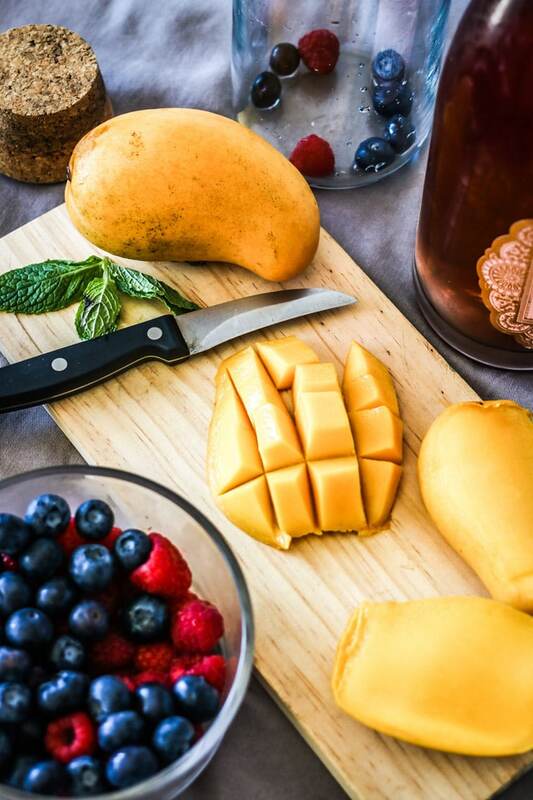 You can never go wrong with fruit soaked in wine! (Says the dietitian). How to top the best sangria? Soak cut fruit garnish mix in wine! You will not be sorry. Traditional sangria recipe…with a twist. 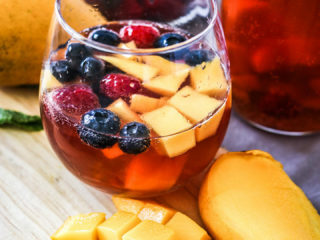 A traditional sangria typically uses a bottle of Spanish red wine (usually a rioja), 1/2 cup Spanish brandy, and 1/2 cup fresh juice (orange is most common). The sangria is best when left overnight and then topped with a diced fruit mix that has soaked in wine for at least an hour. But when have a ever been traditional on this blog? (Exhibit A and Exhibit B). While red sangria is by far the most popular choice, white wine sangria is also an option. But what about sparkling wine? Or rosé, now that it’s having it’s moment? Or, what about sparkling rosé sangria? 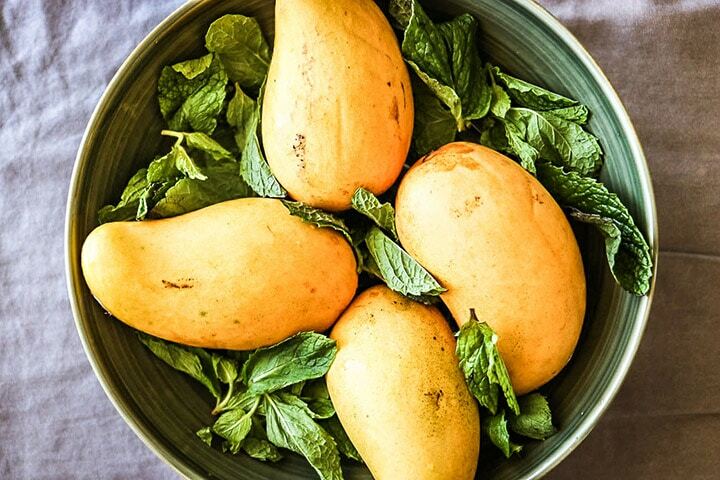 Maybe you don’t have mangos and berries, and that’s fine. I can say with utmost confidence that it will be hard to screw up fruit combinations with sparkling rosé sangria. Summer, fall, winter or spring, any seasonal fruit combination will be delicious. Need a nice pitcher to hold your sangria? 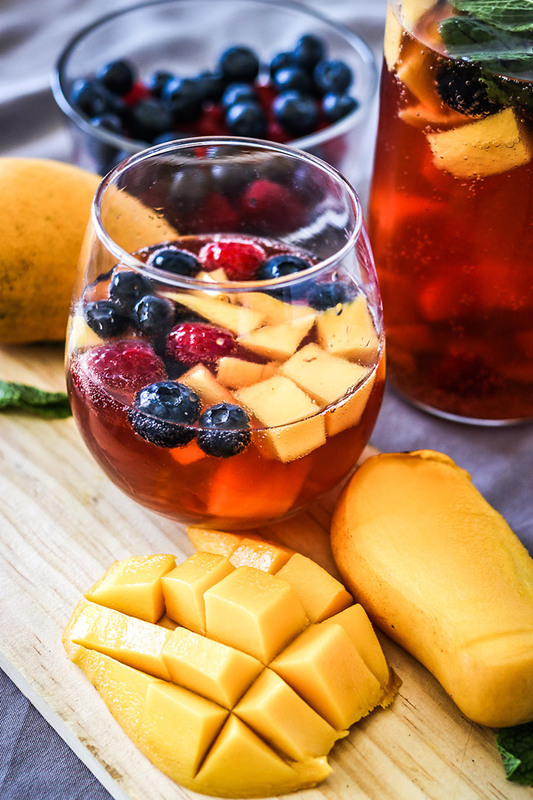 Take advantage of rosé season with this Mango Berry Rosé Sangria. Sparkling pink rosé, mangos, berries and brandy – perfect for your next summer soirée! In a large pitcher combine bottle of rosé, reserving a small amount (<1/4 cup). Add 1 cup brandy and 1 cup juice. Allow to sit in refrigerator overnight, or at least 2 hours if you really can’t wait. Meanwhile, dice melon and berries and place in a small glass topped with reserved rosé and let soak. When ready to serve, pour sangria mixture into wine glass and top with spoonful of fruit mix. Toast to the Spanish for dreaming up such a delicious drink and enjoy! If you are using sparkling rosé, I do not suggest soaking overnight but instead serving immediately to reserve bubbles. However, if using a still rosé then by all means, please soak overnight to get the full flavor.